Let’s start out this review with a simple statistic: Scientists do not know how many people the bubonic plague has killed. The plague outbreak which ran from 1347 to 1352, killed anywhere between 75 million to 200 million people. Now I’ve put that scary statistic in your head, I’m here to bring a entertaining game to your attention. Plague Inc., iOS/Android, $0.99, by Ndemic Creations is a game wherein players have to kill off all of humanity with a pathogen design from the ground up by the player. If you’ve ever played the Adobe Flash game Pandemic, your experience will be very similar in this game. Plague Inc. lets players name their disease and then choose what species of ailment it is. The player’s choices of lethal pandemics are, Bacteria, Virus, Fungus, Parasite, Prion, Nano-Virus, and Bio Weaponry. 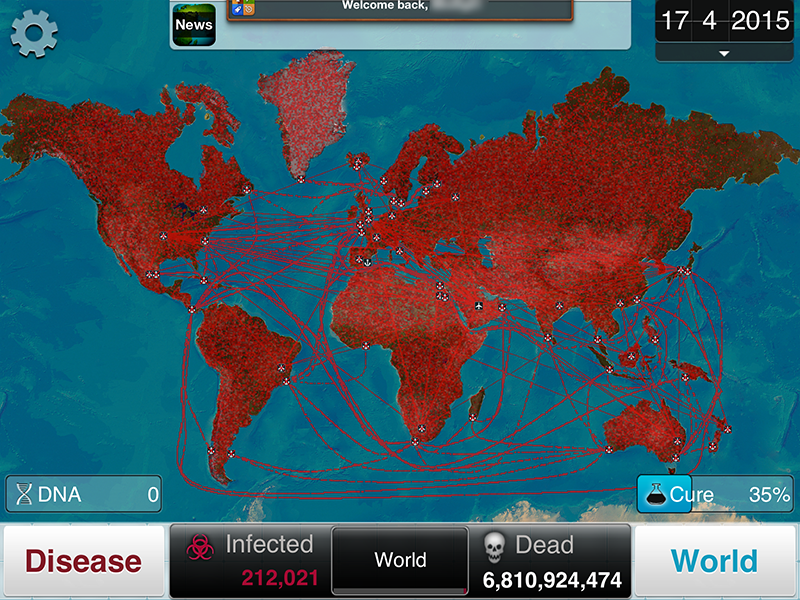 Players also get to choose the starting location of the virus, so if you wish to start in Madagascar you can, or somewhere like India, or Greenland. The game starts gamers out as the easiest to spread disease, the humble Bacteria. Once the the player completes the game on the normal difficulty with the chosen type of microorganism, a new pathogen unlocks. Eventually players unlock Bio Weaponry which will kill anything it touches so quickly, it has little to no chance of spreading. This makes it extremely hard to beat the game. If you succeed in beating even Bio Weaponry, there is an additional disease-causing agent (Necroa, or Zombie outbreak) you can purchase in the form of DLC. I have not bothered to check it out because I am still working on beating the game with all of it’s non-DLC microbes. As the game progresses, players are granted DNA points slowly over time. DNA points can then be spent on altering the disease to prevent mankind from curing it. With these DNA points, perks can be unlocked and upgraded allowing the virus to spread more quickly and aid players in their quest to abolish the world’s population. Occasionally, the game offers special pop-up items like ATP Boosts which give you more DNA to build a better virus at the start of a game, Cytochromatic Surges which grant you more DNA from popping virus bubbles, Metabolic Jumps which grant more DNA, or Ionized Helixes which allows you to get more DNA when you devolve your virus (critical in later stages). Even with these boosts, the game can prove challenging on the “normal” difficulty, wherein it’s the only way how to get to the next type of virus to infect the world. After picking how your disease spreads via birds, rats, insects, blood (STD, etc), things can start looking pretty dire for the human race. To close this out before I give my final summary, I have to remind you of my little information tidbit at the top of this review about the septicemic plague. One case of a drug-resistant form of the bubonic plague was found in the wild Madagascar in 1995. If that doesn’t scare you, you should know that currently between five and fifteen people in the United States are estimated to catch the Black Death each year, typically in western states. It is still around and scientists haven’t figured out how to “kill” it just yet. That is, if they’re not “keeping it around”. Overall, how many games allow you to kill off humanity by being a virus? Not very many. This game deserves a microscopic bit of attention. If not just because the creator was invited to a Center for Disease Control to talk about the games mechanics, but because it’s a lot of fun to play. The value of this title is the biggest selling point for me, at $0.99 it’s practically a steal with as much replayability as this title offers. The soundtrack is a hauntingly beautiful ambient soundtrack by Joshua Kaplan of OpenHeartSound.com. I love the sense of humor in this game and the fact I can name the disease anything I want within character limits. There is something fascinating and addictive about watching a pathogen take over the world and watch the body count pile up. As dark as it sounds, there is something oddly rewarding and satisfying to watching the world population die off. The developer has pretty much implied that more things are coming for the game as it’s just hit it’s one year anniversary and they’re hiring more programmers. However, the game still has its share of flaws. Despite reaching 100% infection rates, those fastidious humans can still keep you down. Seasoned players might find some of the game’s patterns of where boats and planes are heading to be on the predictable side. It would be nice if some countries, Greenland and Madagascar in particular, had airports because they don’t always get infected easily and sometimes it can take some valuable time away from your infection cycle before they are infected. Limited number of characters when it comes to naming your virus limits some creativity with names, but you can be plenty creative if you think about it for a little bit. Overall, for its budget price of $0.99 , I recommend at least trying it.